The Vadodara Municipal Corporation (VMC) is looking to beautify the campus of the Kashivishveshwar Mahadev temple on the busy Productivity Road area in the city. The temple is amongst the nine Navnath Temples believed to be the protectors of the city. VADODARA: The Vadodara Municipal Corporation (VMC) is looking to beautify the campus of the Kashivishveshwar Mahadev temple on the busy Productivity Road area in the city. The temple is amongst the nine Navnath Temples believed to be the protectors of the city. The civic body has already written to the district collector seeking possession of the land to develop it. The space is presently highly congested and encroachments are rampant there. 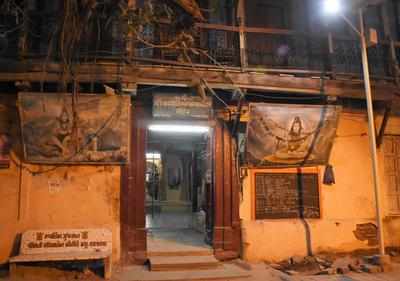 Vadodara mayor Bharat Dangar said that the temple is around 150 years old and some structures around it are around 80 years old. Besides the Kashivishveshwar Mahadev temple, two other temples have also come up in the complex. “Spaces were allocated to the pujaris and caretakers at the temple. Today there are 27 encroachments in the temple complex. We will be rehabilitating those staying there before getting the premises vacated,” said Dangar. Dangar said that the civic body was looking at having a green space in the area along with facilities for children and senior citizens. Around 50,000 square feet of land is available at the site for development. The complex is presently very congested with no open spaces. Mayor added that the temple itself will be retained in its original form. “If the need be, we will restore it,” he said. He pointed out that the work will begin as soon as the land is handed over to the VMC.